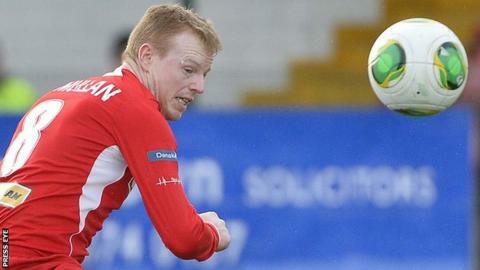 Irish Premiership leaders Cliftonville welcome back captain George McMullan for the Solitude clash with Glenavon. McMullan returns after a foot injury and striker Joe Gormley has shaken off a knock, but midfielder Ryan Catney is suspended for Saturday's game. The Reds are a point clear of Linfield, who will host Portadown without banned midfielder Jamie Mulgrew. Striker Mark McAllister is likely to miss out due to illness while Sean Ward and Ross Clarke are doubtful. Cliftonville will retain the Gibson Cup if they win their remaining three games but the Blues are primed to capitalise on any slip-ups. Joel Taggart presents Irish Premiership coverage on Saturday Sportsound on BBC Radio Ulster from 14:00 BST. Michael Clarke and Liam Beckett will take you through the action from Cliftonville's meeting with Glenavon at Solitude. Michael Hammond and Philip Mitchell will be on commentary at Windsor Park for Linfield's encounter against Portadown. There will also be updates from Saturday's other four matches. Linfield face a Portadown side lying fourth but just two points adrift of third and a place in Europe. "The message to the players has been that we've got to keep this title race alive," Linfield boss David Jeffrey told the club website. "We know we have a massive game against highly motivated opponents - they'll be coming off a cracking derby result against Glenavon so their confidence and spirits will be high. "Portadown are an excellent side. Ronnie (McFall) has class players throughout his team and their desire and hunger to win this game to try and finish in third place will be immense. "We're focused on trying to win Saturday's game and we'll be giving it our all. "We have to be thoroughly professional and look after what we can control and influence, well aware that in this great game the unexpected can and frequently does happen." Crusaders currently occupy third place but midfielders Chris Morrow and Paul Heatley are banned for the visit to Glentoran. Declan Caddell could return to the Crues midfield after an ankle injury, while Glens defender Johnny Addis is suspended. Warrenpoint Town sit in the relegation play-off spot but a win over Coleraine at Milltown will take them above the Bannsiders. Town trio Liam Bagnall, Darren King and Shaun Parr sit out the game through suspension but Kenny Kearns and Paudie Smith return from bans. Suspensions also keep out Coleraine midfielder Stephen Lowry and forward Gary Brown. Ballymena United defender Tony Kane is banned for the trip to Ballinamallard United while Johnny Taylor and Aaron Stewart are injury doubts. Dungannon Swifts have striker Jamie Douglas back from a hamstring injury as they prepare to face relegated Ards at Stangmore Park.